I slept in a little today since I was pretty tired. 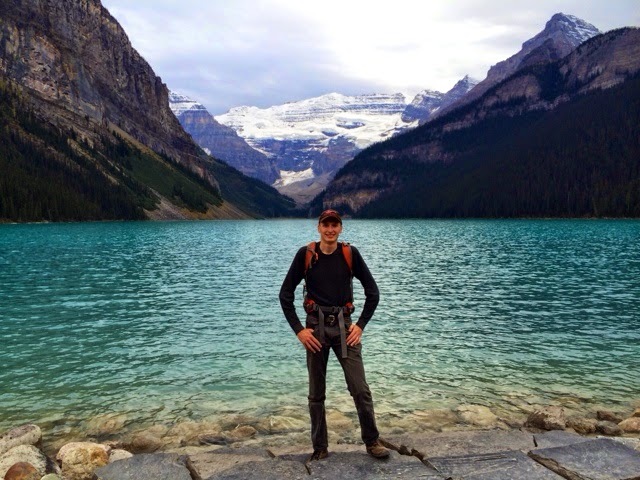 After having breakfast and a quick stop at Safeway and the visitor center, I drove to Lake Louise. Both parking lots where filled with cars and it was super busy at the lake. 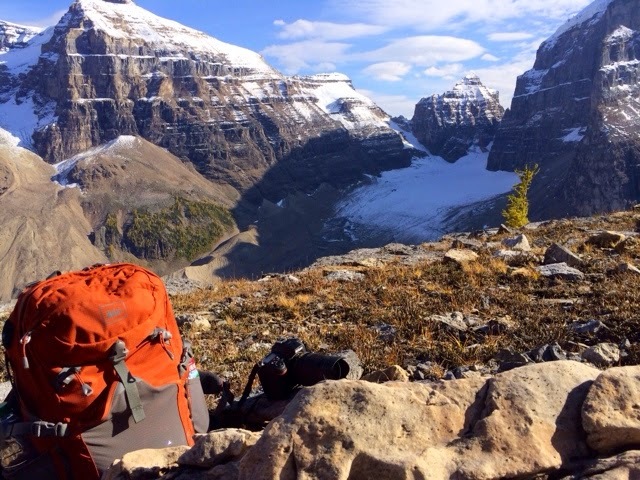 I got my hiking gear and camera out and started hiking up the Plain of Six Glaciers trail. It starts right out at Lake Louise, in front of the hotel. 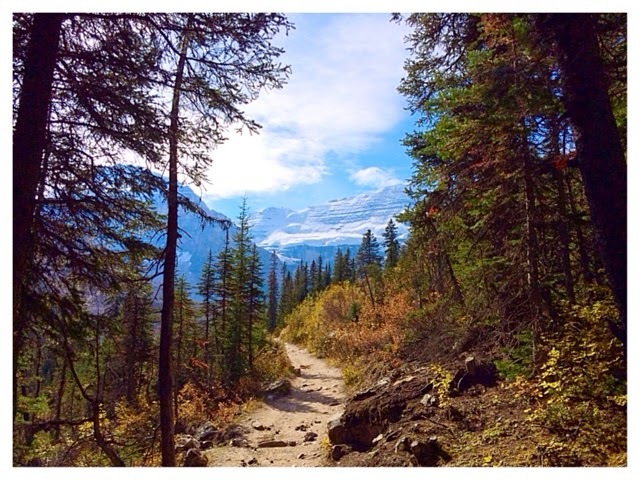 The first 2km follows along the lake, then the trail starts going up towards the glaciers for about 4km until you reach the Plain of Six Glaciers Tea House. 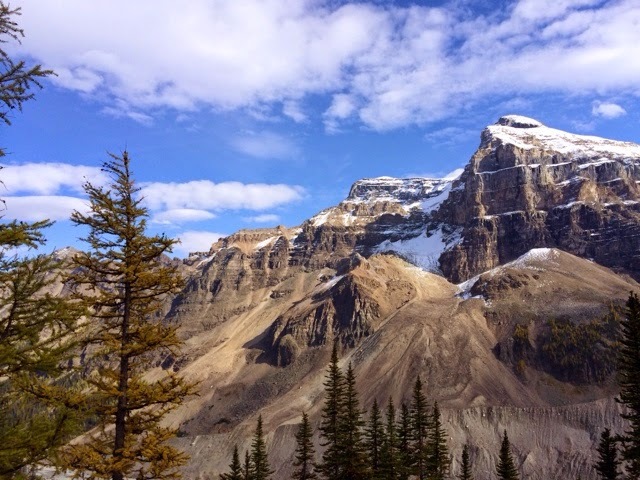 There is another short 1km trail to a view point closer to the glaciers but what I didn't know was that the climbing route starts of the view point trail just past the tea house. I walked of the trail a little ways to get some better pictures of the Larch trees and then I noticed another trail, going right up through all the Larches. It was not marked and barely even visible from the main trail but I decided to go up it and check it out. It soon got steeper and steeper but with each switchback the views got better, so I kept on going. After about 2km I reached a meadow with incredible views in all directions. 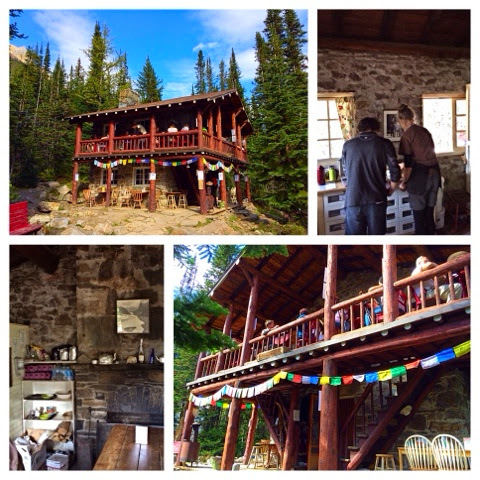 You could see the tea house and Lake Louise way below and I was surrounded by snow covered mountains and Glaciers. I could hear small waterfalls coming down the mountains and the occasional rumbling of an avalanche. 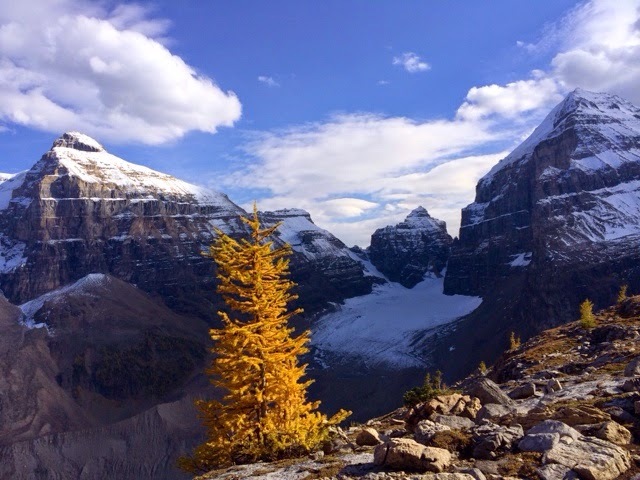 There where a few lonely Larch trees which had turned a beautiful golden. I felt like I was in paradise! Also I had the whole place to myself as all the tourists only went as far as the tea house. It felt incredible to be up here all by myself enjoying amazing views in all directions. I was a little disappointed I had only brought one of my cameras though and no tripod, so I couldn't do any time-lapse photography, but non the less this was one of the most incredible places I have ever been and I hadn't felt this alive and overcome with joy in quite some time. On the way down I met a Canadian couple who asked me how far it was to the tea house. They still had to go about 4km and it was getting dark soon so they decided to turn around. We talked the whole way back and I found out that they just came from Glacier National Park, where I am going next. They showed me pictures on their phone and I showed them a few pictures of the hike I just did and told them about my travels. We said our final goodbye back at the trail head. 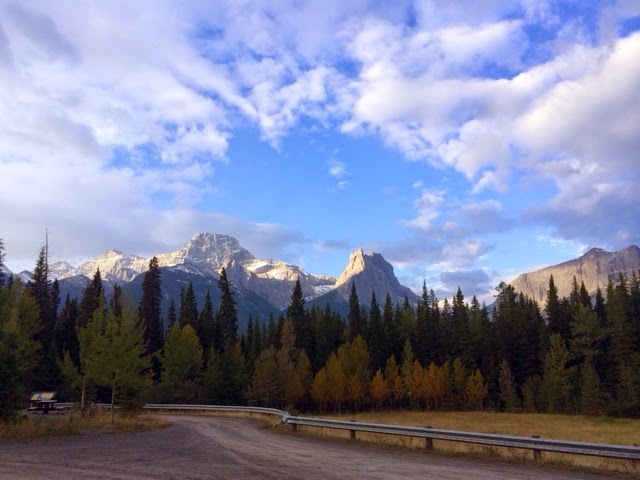 I drove back to Canmore to get dinner and find a campsite. It got dark before I got there which made it a little harder to find a spot to camp so I ended up just car camping at a trailhead. 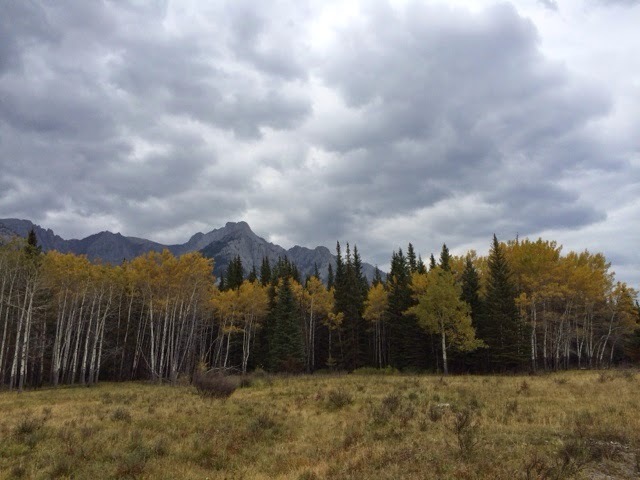 It also started to get really clouded out and looked like it might rain, so it tuned out to be a good decision. Best day of the trip so far! I woke up to another car parking next to me at the trail head. It was still really early and just starting to get light out. Lots of clouds had moved in overnight and more where coming my way but there where still a couple clear spots in the sky which made a good time lapse photography opportunity, so I quickly got out my camera and tripod and set it up. I had breakfast while I let my camera do the work. The clouds where moving really fast and about an hour later it was completely clouded. I drove to town and stopped at the visitor center to use their wifi and update my blog. After I was all done it was almost noon so I bought lunch and headed out to drive the more scenic HWY 1A towards Lake Louise. The clouds got more and more grey and soon it started raining. It didn't stop me from still taking some cool pictures of the fall colors but I decided not to go hiking today. Instead I kinda took the day off and just relaxed for the afternoon. I stopped in Banff to buy some postcards but everything was so expensive that I only bought one really nice one to send out. 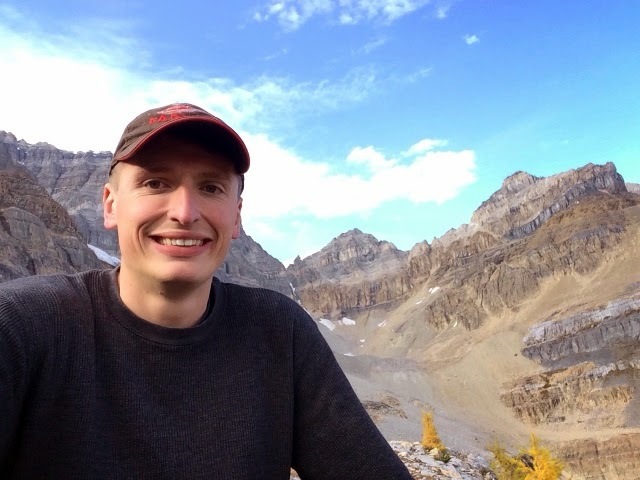 I found out that my favorite restaurant in Banff was no longer there so I had dinner in Canmore instead and then went to the Hosteling International just outside of Canmore. 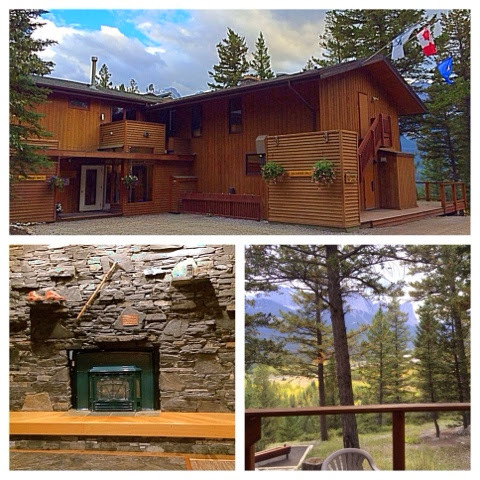 The building is shared with the Alpine Club of Canada and it looks more like a resort than a hostel. Definitely the nicest hostel I have ever stayed at! It was still early and although it had stopped raining it was still completely clouded out so I didn't expect to be able to do any sunset photography and instead enjoyed sitting on the deck at the hostel, catching up on my blog for the last 2 days. There where some German guys behind me, so I tried to understand some of what they where saying. My German is definitely not what it used to be but I was still able to sort of follow along. I took a nice hot shower and went to bed early to get some good sleep before the long drive to Waterton Lakes and Glacier NP, the next day.